Home / Leisure / My Learnings in Life / Uday Sankar Yerramilli / Gen Y versus Gen X - Are they missing the real essence of life?? Gen Y versus Gen X - Are they missing the real essence of life?? ‘Chokhi Dhani’, a Theme based Ethnic Village Entertainment accompanying a Rajasthani Cuisine Restaurant. I happened to visit this place in Pune as a part of our company get together and found it to be quite interesting. 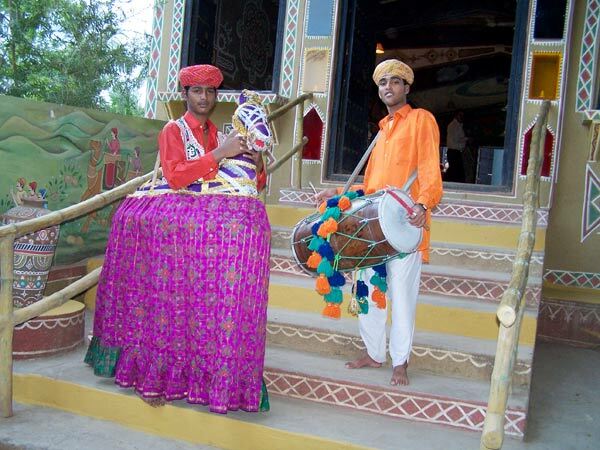 A mini-village spread over 18-20 acres of land; this is an epitome of the Rajasthani culture. A revival of Rajasthani folk life, culture and tradition, Chokhi Dhani makes us feel like an honoured guest of a Rajasthani village. Except for the fact that this is built on alluvial soil unlike the desert sand dunes of the Thar, it exudes warmth and honour to its honoured guests. This has a Village Mandir of Lord Krishna at the entrance, a small bazaar, ghanta ghar, bioscope, jyotish (the fortune teller), jadugar (the magician), a puppet show, and not to forget, the great Indian Rope Trick. There are also some stalls hosting the pan wala, malish wala (both head massage & body massage), roti wala, etc. Towards the rear end of the plot, there are the typical village rides like the mini-giant wheel (hand-operated), mini-Columbus, Chokhi Dhani Express (the mini toy train), Horse ride and a signature camel ride. A day at Chokhi Dhani gave me a nice experience of Rajasthan though I had never been there. For a moment I was drawn into my memoirs of a typical Andhra village. The first half of my childhood, I spent in Kadiri, a very small town in A.P, and the latter half of my childhood at Anantapur, a fairly big town. However, 3 months of every year, were reserved for my native place(s). My holidays were always a treat. I still remember my days at Borrampalem, my maternal grandmother’s village, during my summer vacations. A village, I’m sorry; A Family of around 2000 people, who lived for each other. The warm welcome that I and my cousins received everywhere as the Village Headman’s grandchildren; the lovely mangoes with creamy curd rice that we had for breakfast, the watermelons that we were offered wherever we went within the village, the steamy Idlis & mirchi bajjis that we occasionally ate at the local ‘5 star’ hotel, the cricket we played in the fields, the evenings we spent lying down unnoticed on the huge heaps of hay, and the list goes exhaustive. Even now, faint memories of the village still elate me to a different level. My native place Kakinada, the hometown of all my aunts, was another good retreat. One home where all my aunts, uncles and cousins reunited was my grandmother’s home. All of us waited for the summer days to come. The huge wooden swing in my grandmother’s home was our place of entertainment. We used to sit on it all day, swinging, counting the cycle-rickshaws and buses that ply on the main road in front of our house. In between, we used to play Snakes & Ladders, Ludo, sometimes Dumb-Charades and Antyakshari imitating the-then heroes. By evening, all of us are on the terrace, attempting to pluck guavas, mangoes & tender coconuts from the trees using our Monkey tricks. Sometimes, we slipped and fell off the parapet wall onto the sunshade, and later, we tried hiding our bruises from the special treatment of our parents. My routine days were also a treat, though not as exhaustive as my holidays. My father is a Railway employee and I did my entire schooling at Anantapur. So, we had the privilege of staying in the Railway Quarters. Every evening, after returning from school, all the kids in the colony assembled at my home and we played till the temple bells rang at 7:30 PM. We played all sorts of games; Cricket, Ghilli-Danda, Hide & Seek, Lagori (seven stones game), and what not. 7:30 sharp, there used to be an Aarti in the Ganesh temple in our colony, and all of us, caste, creed, gender, religion no-bar, attended it regularly. 15 minutes later, we walked out in pride with the delicious ‘prasada’ in our hands fighting about who got more ‘prasada’ that day. Sundays were always special. The days when Doordarshan was the only channel, every one of us got glued to the televisions in the morning awaiting ‘Rangoli’, and ‘Chandrakanta’ and of course replaced by ‘Sri Krishna’ at a later point of time. After this, the government college ground was our refuge. Almost 20 of us, boys and girls, armed with cricketing gear, used to invade the ground. Almost every alternate Sunday, we got a nice discourse or a gentle beating from our parents for skipping lunch. Throughout the day, we were elite customers to the push cart selling ice creams & ice fruits. 20 paisa per stick, I remember, we used to devour at least 10 to 15 of them each before the game ended. Now, all of us are scattered across various places in the country, some of us (the girls) married and settled abroad, we know that we have had a wonderful childhood. And this was not too early in the past; it was as late as the nineties. Now, in a short span of a decade, the whole world looks transformed, thanks to the Technology explosion. ‘Urbanization’ has been the buzzword of the decade in India. India has always been proud of its growth and its ambition to be a global leader, however, in the process, we lost something important; our villages have probably become mere epitaphs in our journey towards being an ‘advanced’ nation. The same has also been reflected in the way the current young generation finds its environment. Ever-growing costs are forcing both the parents to work. In the process of 2X’ing the income, parents are finding much lesser time with their kids, which they try to compensate by the increased purchasing power. Today’s young generation only talks of gadgets. I have been seeing many Gen-Y kids at functions, family get-togethers, and more to it, among my own relatives. They love virtual more than real. The mindshare of vast playgrounds has been replaced by Playstations. Kids hardly like to interact with others. You get a customary ‘HI’ when you visit a home and then later, the kid is lost in his own world of gaming. They have also become more demanding and stubborn than their Gen X counterparts. To add to this, the schools have become mere business ventures and not education centres. The other states, I see, are much better in this regard, however, in Andhra Pradesh, every parent wants his/her child to be an IITian. And the schools just have to pull and not sell. The child is put through extended hours of torture beyond his mental and intellectual capacity thereby, exhausting him of all his energies. The result, he is tired at the end of the day and doesn’t seek to move out of home. The schools have a wonderful way of disguising their greed for money in the garb of ‘philanthropy’ for the child. They claim as if they are doing everything to bring up the standards of the kid despite all resistance from the kid. The fact that ‘all kids are not alike’ is shattered by the lens of equality (parents’ ambition to see the kid as an IITian). Once in a while, the family goes out for a breath of fresh air and Shopping Malls take most of the timeshare. Probably once in a year, the family goes out to tourist spots. Amidst all these, an average kid beyond school hours spends hardly less than an hour with people, almost two hours with gadgets (phones, gaming consoles, and the likes) and about less than an hour, surprisingly, on facebook. The remaining time, is lost in academic reading that is a prerequisite to even survive the rat race. So, on one hand, the kids are also not to blame, for, it is not their very nature but the nurture that’s making them do so. So, the kid seldom gets opportunities to interact and live with nature. This reminds me of the rural stint as a part of a project that I did last June. This was in the Raigarh district of Chhattisgarh. The villages were so beautiful, natural, serene, calm and peaceful, however, all the kids study in the neighbouring towns, most of them staying at the residential campuses in the concrete jungles. So, the villages are losing the youngsters. Later, these people end up settling in the towns because they find better opportunities there. The result, lesser people for agriculture day by day. Now, if we look at the way relationships are built, yesterday’s relationships among kids were based on the platform of love. There was hardly any complexity of thought in relationships. Most of them were less need based. However, today, most of the relations are centred on need and ego. The kids are starting to look at things through an entirely different lens, the lens of money & possessions. It is high time that the parents groom the kids to establish their relations through a loving contagion rather than an impenetrable ego. And before I end, if I really have to judge on the quality of childhood of the Gen Y kids against that of Gen X, I feel that We, the Gen X stand better. No doubt, the present kids are technologically more equipped, have more comfortable lives, however, they are missing out on those small moments of happiness in life. Most of their experiences do not carry a ‘Nature’ factor in them; rather they are artificial and sometimes virtual. With virtual experiences, artificial food, are we really heading in the right direction? Can their pizzas match our pancakes? Can their French fries any day stand a chance against our mom-made murukku?? Can their Playstations provide enough energy and exercise as our playgrounds? Can their burgers get as juicy and mouth-watering as our bajjis?? Well, my answer is NO.